Last week I got an email from my friend Bob, Wisconsin correspondent for the Great Lakes Brewing News. He sent me an itinerary of a mini-tour that he and those involved with Madison’s Great Taste of the Midwest, a beer festival that many refer to as the best in the country-even better than the Great American Beer Festival. Since I’ve been to neither (which I am a little ashamed of), I can’t comment. Regardless, it is a highly acclaimed event. 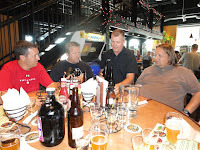 I, along with Tim as the other Beer Trip guys were off camping, decided to make our way over to High Noon Saloon and Brewery in Leavenworth, Kansas to meet up with them for a little bit. They were scheduled to be there at 8:15 PM, so Tim picked me up (since I drove to Gordon Biersch on Wednesday) around 7:30 and we headed to Leavenworth. We got there right at 8:15 PM. When we got there, we saw that a band was playing and I was asked to pay a $5 cover charge. I’m not sure why, but this really annoyed me for about two minutes. I told the guy at the door, who was really nice about it, that I was just meeting the brewery guys from Wisconsin and didn’t want to pay any cover charge. He was about to go ask a manager about it, when I just said, “Sorry. I don’t know why I am so against a $5 cover charge. Here you go.” I still hate cover charges at a brewpub, when I just wanted a couple of pints of their beer, but I get it. I just wish the band was better. After a bit I told a guy by the bar that I was Dan, the guy who used to write about Kansas for Southwest Brewing News, and he seemed to recognize me. He even bought me a beer, which was nice. I told him that I was friends with RD, the owner, which is probably a stretch by I really consider myself friends with all of the Kansas brewers that I covered. And I miss talking to them every other month. He came over and talked to me for a bit, and I told him that I was going to tag along with the Wisconsin guys when they came in to take a tour. He said they were running late but that was fine, and he went back to his family. Tim and I grabbed a table, another beer, and we waited for Bob and crew to arrive. About 9:30 PM, they arrived. They had a large crew, and these guys were doing it up right. They had a nice bus, with a driver, and a solid itinerary chock-full of brewery and brewpub visits (and even a distillery). They even had the itinerary printed on t-shirts that they wore, which is arguably a step up from the buttons the Dahlbeeyotch made for us for Beer Trip V (“Shut up and drive! It’s Beer Trip V!”), but I prefer the buttons. Bob introduced me to a few people in the group, including a couple of brewers from Ale Asylum in Madison and the guy behind the Great Taste of the Midwest. They were all really great guys, and it is an event I’d really love to go to sometime. After a few minutes, RD come around and asked who wanted a tour. 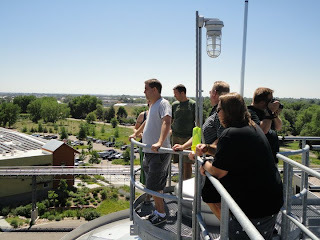 About three-quarters of the group went to the brewhouse for the tour, which was interesting enough. At the end, RD gave them all a glass, which was one of the more practical brewpub pint glasses that I’ve seen. It had the High Noon logo on one side, and the back had a list of their flagship beers. It ended up coming in hand a few times when people were asking me what High Noon beers they had. I thought it was a cool idea. We went back to the bar, talked to a few more people, and before I knew it, they were headed back to the bus. Before they left, Bob was nice enough to bring me a few Wisconsin beers for me, including some from my friends at O’so (Night Train!). It was pretty cool. They left, and Tim and I had one more Stumblin’ Reindeer, their winter seasonal, which was really good. After the band played their rendition of “Cherry Bomb”, we felt it was time to call it a night. We made the drive back home, and I gave Tim a couple of the beers Bob gave me for driving me. It wasn’t an eventful night, but it is always great meeting people in the beer industry. And I like checking out the local brewpubs when I can, which isn’t as often as it was when I was the Kansas correspondent for SWBN. So basically, I had a really good night, and hopefully I can make it back to High Noon again soon, and hopefully someday to Madison for the Great Taste of the Midwest in the next few years. I haven’t written in a while, but mostly because I hadn’t done a lot lately in terms of beer. Having a baby girl will do that. No complaints from me. But I got an email from Gordon Biersch in Kansas City recently about a release party for their winter seasonal Winterbock, so I decided that this would be a good thing to do. It also happened to be on the same day as the 21st Anniversary/Birthday of Boulevard Brewing Company, who had some events planned for that night, so it seemed to be a good night to go out. Tim, fresh back from India and Europe, decided to come with, so we decided to take our talents down to Kansas City’s Power and Light District for a few hours. When we got to Gordon Biersch, it was pretty crowded and loud. They had an 80’s trivia night, and we walked in right by the guy running it. We saw the brewer from GB, James, there, and he was changing out a keg of the Winterbock to give out samples. We stopped and grabbed one, then Tim, who also brought a few cans of food for Harvesters, and I grabbed a table to have dinner. One thing to note is that if you are a fan of Gordon Biersch Kansas City on Facebook, you can print off a free order of their garlic fries. Luckily for us, I did, because they are really, really good. We ordered some dinner, and I ordered one of their Marzens while Tim ordered a mug of the Winterbock. The food was pretty tasty, as I ordered the chicken tenders off of their seasonal menu and Tim had a pulled pork sandwich that he really liked. Everything was really good. Our waitress was very good and friendly, and I do enjoy GB’s beers. They don’t go crazy with hops or high alcohol brews, although the Winterbock tipped in at 8.2% ABV, but what they make is great for the style. I enjoy marzens, and theirs is very tasty. As we were walking out, I stopped and talked to James for a bit. He seemed like a pretty cool guy, but it was crowded there, he was pouring the samples, and I am not a pretty lady, so I kept it short so not to bother him, and we moved on to Flying Saucer. Flying Saucer for those who are not familiar is a great beer bar. They have one of the best beer selections in the city, if not THE best, and it’s a cool, laid-back atmosphere. Plus they have couches, which Tim and I took over when we arrived. The big deal that night was “keep the glass” night for the 21st Anniversary Fresh Hop Pale Ale for Boulevard. We were told right away that the glasses were gone, which wasn’t a big deal to either of us. Tim first ordered their “Fire Sale” beer, which was Bell’s Oktoberfest, while I ordered a water (since I was driving). He liked the beer, and when he decided to move on and get the 21st Anniversary beer without the glass, I followed suit and did the same. While it is probably not the typical style for a big anniversary beer, we both enjoyed it. I found it to be a better than when I had it previously from a bottle. We looked around, and were told that they were going to have a toast to Boulevard at 10 PM, but as I looked at my phone and saw that it was 10:02, we knew that wasn’t happening. We saw on Facebook that some of the Boulevard people were at a bar nearby, Ragland Road, but when we got there they were nowhere to be seen. They did have some mini-cupcakes left though, so we had a couple of them as Tim ordered another beer while I again had a water. We hung out for a bit, watched a young lady jump on a platform and do an Irish dance, and decided to call it a night. It was a pretty nice night, despite the crappy weather and even crappier team name change for the Wizards. 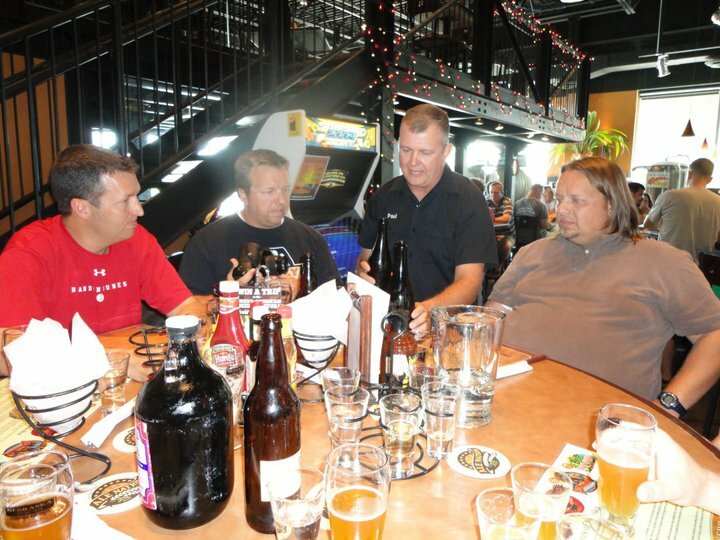 I hope to attend more of Gordon Biersch’s seasonal release parties, as it was a cool, little event. Free garlic fries and free samples of their beers don’t hurt. Especially when that free beer is a tasty 8.2% offering. When someone says craft beer, one doesn’t immediately think of emerging market countries. And honestly, there’s a reason for that. Recently I spent a few months in India for my day job, and while there, I was excited to try their take on craft beer. The first thing I’d advise someone about India-nothing is convenient. I was based out of the Delhi suburb of Noida not far from the city of Gurgaon where all three of the Delhi area breweries are based. While by American standards, it would be just down the road, by Indian standards it’s quite a trek. I rented a car and driver for 6 hours to go to two brewpubs. Freeways are scarce, and traffic jams common. Basically anything goes on their roads. Lanes are a suggestion, as they’re supposed to drive on the left hand side. If that’s inconvenient, they just drive on the right. The second thing I’d advise is that the beer scene in India in still “nascent,” as one of my Indian colleagues put it. The main reason people drink in India is to get drunk. There hasn’t been the disposable income to care about taste or quality. Basically they need more bang for their buck. If that means buying a Haywards 5000, which honestly tastes like a Bud Light with an alcohol burn, so be it. However, there is an exploding middle class developing, with an expanding disposable income, which is searching for more than a quick drunk. My first stop was Howzatt brewpub. It’s located at the Galaxy Hotel in Gurgaon and is a cricket-themed bar. A little insight on Indian culture-field hockey is their national sport. Cricket is their religion. I honestly was shocked by brewery. Despite being a five star hotel, I didn’t expect how modern of a facility they have. I walked into the brewpub, and I immediately was hit by the aroma. I was lucky enough to go on a day they were brewing. After six weeks in India and no beer exposure, it was a moment of pure joy. We sat down and looked at their menu. They only brew three beers, a lager, a dark lager, and a wheat beer. We started with the lager. There were three of us, myself and two of my American colleagues that were working in India with me. They had pitchers that poured three pints. Roughly cost $8 so very cheap by American standards. The lager is what it is. I have to be honest that lagers aren’t my favorite style. However, compared to the mass produced Indian beers I’d had up until this point, it actually had character and flavor. Next we tried the wheat. This could have been an excellent beer, but it was overpowered by an overabundance of wheat. It was like chewing on a stalk of wheat. It wasn’t awful, but they need to tone down the amount of wheat they use in the brew. Third on the list was their dark lager. This was actually their best in my opinion. It had a great malty flavor with enough hop balance that it wasn’t overly sweet. Overall, Howzatt was a great brewpub, and one I’d liked to have returned to if it wasn’t such a hassle getting there. Next up on the mini-tour was Rockman’s Beer Island , again in Gurgaon. However, we got caught in traffic and it took about 45 minutes to go the 15km from Howzatt. Located on the 4th floor of the Ambience Mall, it is a large complex of restaurants and pubs. We were seated in the Bavarian Pub Brewery. It’s supposed to give you the feeling of being in Germany, but not so much. They have five beers available. They had a lager, strong lager, a dark, a wheat, and a special Oktoberfest. I tried the Oktoberfest and it tasted like a standard lager. The beers were much pricier here, and a 20oz glass was just short of $10. Because of that, I only had one more, the dark. It was decent, but not worth the cost. On a non-brewing note, I did find Leffe at Route 04 at Kahn Market in Delhi. Overall, the selection you’ll find at a bar includes Kingfisher, Corona, Budweiser, Tuborg, and possibly Victoria Bitter or Fosters. Lagers are the preferred style in India so that’s what you find. I actually had someone ask if I’d ever had a Guinness because they’d heard good things about it. I was also told that if you go to Mumbai or Bangalore, you may find a better selection. But in Delhi, there wasn’t much to be found. India is developing a beer culture, which gives it potential. With the large number of Americans, Europeans, and Australians being sent there for business, craft beer could make a killing, especially in the urban centers. However, at this time, it is not a destination for beer-lovers. Possibly in five to ten years, I would imagine that you’d find a much better selection. Hopefully if I have to go back, this will be the case. Either way, I know I’ll be packing my suitcase with some beers from home. You can never be too sure. Day Five. Always a sad day for me. We normally take it easy on the fifth day, as the previous four have caught up to us. Also, the majority has wives and kids at home, and they don’t want to return home half-wasted. We set out from Ogallala, NE early in the morning. 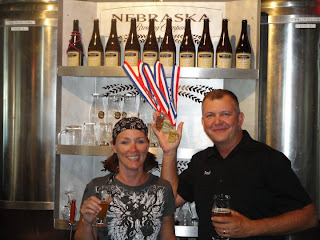 Our first of only two stops that day was actually a repeat visit: Thunderhead Brewing in Kearney. We had stopped there in Beer Trip II just as a stopping point, honestly not expecting too much. Thankfully we were treated to some excellent brews, so good in fact, we wanted to return. As luck would have it, we even had the same waitress we had four years ago. She remembered us somewhat, but the group had changed a lot since then. Again, the brews were really good. That’s one of my favorite parts of Beer Trip. You’re in a small city in a low populated state, yet you find delicious beers being produced there. The Cornstalker Dark Wheat is one of my favorites, along with their MacTawisch Scottish Ale. They also have begun canning a couple of their beers since the last time we had visited. The Goldenfrau Honey Wheat and the Cornstalker are both available to take home or, because they can instead of bottle, to take tailgating, to parks, or camping. It’s a good thing, in my humble opinion, that more and more craft brewers are canning some of their beers. Bottles will always have a place, but for portability, you can’t beat a can of beer. 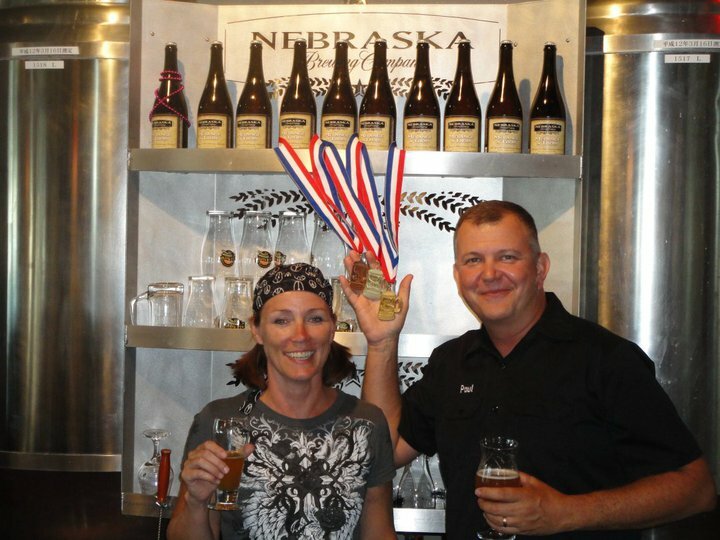 After we finished up lunch and brews at Thunderhead, it was time to go to our final destination, Nebraska Brewing Company in Papillion, Nebraska. We had heard the buzz in the beer community about what they were doing there and were excited to finally visit. We’re only a few hours south of NBC, but they don’t distribute to our area, and none of us had found the time to go up there, even for a day trip. Thanks to social networking I had connected with the owner, Paul, on Facebook. I had told him what we are all about and that we were going to be visiting, and we all hoped we could meet him if it fit into his schedule. Luckily for us he said he would be there and was looking forward to it. We arrived in the late afternoon. It is located in your standard suburban outdoor shopping center, but what goes on inside is anything but standard. Also, we were meeting with some fellow craft beer advocates, Chad who lives in the Omaha area, and Dave, who came up from KC. We were welcomed by Paul almost as soon as we got in the door. He had set aside some tables for us in the bar area of the restaurant and he, along with his wife Kim, were soon bringing us over a huge selection of their fantastic beers. Their Hop God IPA I could not get enough of. It comes as no surprise it medaled in the World Beer Cup. It’s a Belgian style Tripel but hopped like an American IPA. It was a beer of true beauty. Thankfully I wasn’t driving that day, so my only concern was keeping my taste buds alive. The Cardinal Pale Ale was another hit with me. Throughout the tasting experience Paul and Kim were both there telling us about the beers, telling their story, and making the experience even better. I feel like I say it too much, but it never fails, that you will never meet greater people than those in the craft beer industry. They even pulled out some of their special and limited releases for us to try. Again, they are worthy of the high marks they receive. The Melange A Trois, which just won a bronze medal at the Great American Beer Festival on Saturday, and Black Betty were amazing. Before we ate Paul took us on a tour of the facility. I was oddly fascinated by the fact their brew system came from Japan. Maybe it’s because most everywhere you visit get theirs from Germany, so this was really cool to me. Also, they actually barrel-aged their beers right there in the restaurant. I assumed they were there for decoration, but no, they actually were filled with delicious brew. After the tour we ate dinner (no surprise, awesome food too) and hung out with Paul and Kim some more. We ended up staying about three hours longer than we had planned, but that’s a very good thing. Paul and Kim humored us by each putting a sticker on the back of the EM-50. Without any doubt in this one Tripper’s opinion, the best Day Five stop in BT history, and one of the best ever on any of the Beer Trips. I was unable to go there for the Black Betty release this fall because work has me out of the country, but I don’t plan on missing any more of their releases. It was the perfect end to one of the best Beer Trips we have taken. Now the planning for Beer Trip VII begins in earnest, and the hope that it will be as good as VI. No matter what, I know we’ll meet great people and have a great time. You’ll be hearing from me soon, I’m sure.